Electric power steering (EPS) is a prime example of the evolution of the automotive industry and how there is a slow transition from classic hydraulics to electrics. But have you thought about the reasons why this transition is occurring? One important reason is increased fuel efficiency. This is due to the exclusion of the power steering pump from the steering system. As the pump can use up to 10 horsepower under load, with the removal of this pressure on the engine, the fuel consumption will decrease. Furthermore, an advantage that comes with an EPS system is that with the removal of the pump, hoses and use of power steering fluid, there are no worries of leaks occurring in the system and there will be a substantial decrease in weight. Instead of being powered by the engine like hydraulic power steering systems, an electric power steering system is driven by a permanent magnet motor. Due to the system not being reliant on the engine, the electric motor will not drag on it, as it will only use energy when the driver requires steering assistance (when the steering wheel is being turned). Thus, fuel and energy are conserved. Due to these benefits, and with the fact that an electric power steering system provides a more refined steering and handling experience, EPS systems are becoming more common and popular in vehicles. What Does The EPS System Consist Of? Torque Sensor – Measures the amount of torque, or in other terms, the effort being applied by the driver to the steering wheel. Electric Control Unit (ECU) – This will calculate the amount of assisting torque required, based on the input data from the torque sensor. Electric Motor – The ECU controls this components direction and the amount of assisting force it will generate from its position on either the steering rack or steering column. Reduction Gear – This component will input the necessary power assist to the steering mechanism. Opposed to a hybrid power steering system, where a hydraulic pump is run by an electric motor, electric power steering systems are fully electronic and they work by combining all the information from each of the main components mentioned above. Let’s begin with how EPS systems work. As stated, an electric motor is fixed on either the steering column or the steering gear (a common EPS configuration incorporates a rack and pinion steering gear). When a driver either turns the steering wheel to the left or to the right, steering sensors at the steering column will detect the position and speed of rotation of the wheel. Along with extra data from the torque sensor (i.e. steering effort) that is usually stationed in the steering shaft, all this input information is sent to and evaluated by the electric control unit (ECU). Furthermore, the ECU is sent additional data such as vehicle speed, inputs from the ABS and the electronic stability control (ESC) system. This module then analyses all the collected information and determines the proper amount of steering assist that is necessary. Subsequently, the electric motor fulfils the decided amount of steering assist advised by the ECU. Whilst the motor is rotating, attached to it is a sensor specifically known as the motor resolver sensor, that measures the rotation and transfers the feedback to the ECU. 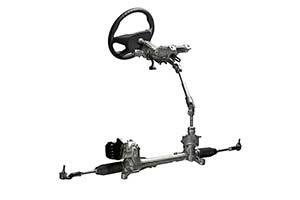 Depending on the type of surface your vehicle is driving on, the amount of steering assist required will vary. For example, driving on snow or sand would require much more steering assistance than if the vehicle was driving on a clean road surface. So, with the EPS system incorporating information from other sensors, an accurate determination of how much steering assist your vehicle will need in those specific driving conditions will be provided. Normal/Operational/Standard mode — In response to sensor inputs and vehicle speed, left and right power assist is provided. Throughout normal operation, as the speed of the vehicle increases, the level of assistive torque applied will decrease. Assist limitation — This mode will be activated in a situation where any of these three scenarios occur: the ECU is not receiving any data, the ECU has overheated or there is a fault with the controller area network (CAN). Assist off — In any scenario there are any problems with any of the main EPS components, the system will be switched off. If your vehicle is installed with electric power steering and you’re facing some problems with it, we at Power Steering Services are at your service! From electric power steering pumps to electric steering racks and columns, our specialised technicians can rebuild and provide them for a large range of makes and models. To ensure all OEM specifications are met and exceeded, any EPS unit we install in your vehicle are fully tested under all driving conditions and you can be assured that each unit is equipped with a lifetime warranty! So don’t delay, contact us today for a free quote. Tags : Electric Power Steering Guide, Electric Power Steering System Guide, EPS Systems, EPS Systems: What Are They & How Do They Work?, EPS Sytem, What Is Electric Power Steering & How Does It Work?, What Is EPS And How Does It Work?.